Fresh from performing with How To Dress Well at Perth’s International Arts Festival, Melbourne five piece AXOLOTL announce an April residency at The Workers Club featuring some of Melbourne hottest and most cut edge acts, DJs and producers in support. Marching to the beat of their own drum machine, AXOLOTL is led by front woman Ella Thompson and features Dustin Mclean (Keys), Natasha Rose (Guitar), James Gilligan (Bass/Synths) and Leigh Fisher (Drums). With roots in classic songwriting but influenced by leaders of the new school like Sonnymoon, Beach House and SBTRKT, AXOLOTL’s style goes from whimsical folktronica to full-on beat assaults and Pop in the space of a few songs. Their current EP Autonomy was released late 2012 and is a succinct snapshot of their burgeoning career thus far, filled with all of the promise of productions and shows to come – some of these new tunes you will definitely hear first at the Workers Club residency before their debut album, which is to be released later this year. 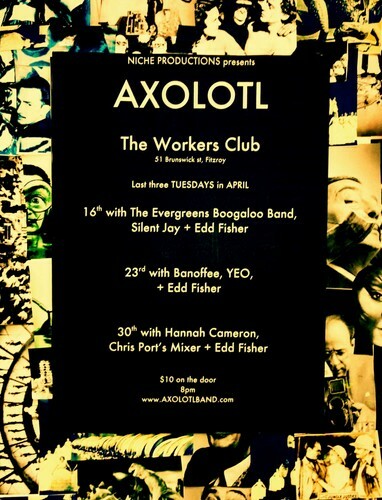 Don’t miss AXOLOTL on select Tuesdays in April at The Workers Club, Corner Brunswick and Gertrude Streets Fitzroy, Melbourne. Tickets on the door, doors at 7:30pm.